The method that someone uses to get to a news web site is a major indicator of their behavior once they arrive there, according to a new study from the Pew Research Center. The analysis of comScore data on desktop and laptop traffic to 26 top news sites finds that direct visitors—those who come to a site by typing in a URL or clicking a bookmark—behave quite differently from those who use search engines or social media to get to news. The data used in this report was averaged over April, May, and June of 2013.While it does not include mobile device traffic, Pew Research Center surveys have found that desktop news consumption still outpaces mobile. In 2013, 82% of Americans reported getting news on their desktop or laptop (35% did so “often”), compared to 54% of Americans who get news on their mobile device (21% did so “often”). Here’s what we learned about three important pathways to digital news—social, search and direct—and what they tell us about user engagement with online content. 1Visitors who type in the URL or use bookmarks to go to top news sites were far more engaged with content than other visitors. These direct visitors spent 4 minutes and 36 seconds per visit on news sites, while visitors who arrive from Facebook spent only 1 minute and 41 seconds and those from search spent 1 minute and 42 seconds. They also viewed more content—almost 25 pages per month compared to visitors from Facebook who viewed only 4.2 pages and visitors from search, at 4.9. And this group also returned far more often to the same news site, visiting 10.9 times per month compared with 2.9 for Facebook visitors and 3.1 for those coming from search. 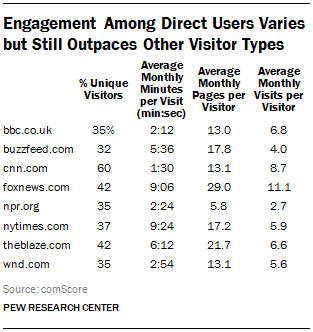 2 Even among these direct visitors, the level of engagement varied widely at different news sites. For example, visitors who arrived at FoxNews.com via a URL or bookmark spent, on average, 9 minutes and 6 seconds per visit. Those going to the site of rival cable channel CNN (CNN.com) the same way, however, spent 1 minute and 30 seconds. Direct visitors to NPR.org viewed, on average, 5.8 pages a month. But those coming to BuzzFeed.com, viewed three times as many pages—17.8. 3Visitors tend to come to a website using only one pathway. Online news readers seem to be creatures of habit. Among the vast majority of the sites studied, a very small number (.7% and 2.3% in a month) of direct visitors who came to a news site directly also visited through a Facebook link. And the percentage of Facebook visitors who also came to a site as a direct visitor was quite small as well—between 4.4% and 13.6%. These numbers not only suggest that Facebook and direct visitors represent largely different audiences, but that it may be difficult for news organizations to convert social media visitors to the more engaged direct users. 4A few news sites stand out for high Facebook traffic. Three very different kinds of news sites were among those getting the highest percentage of their traffic through Facebook, according to comScore. In the lead, by far, was an ideological site with modest overall traffic, Mrconservative.com (73% from Facebook). Next was the digital native site Buzzfeed.com, at 50%. That was followed by the legacy public radio site, NPR.org, which got 22% of its traffic from Facebook. 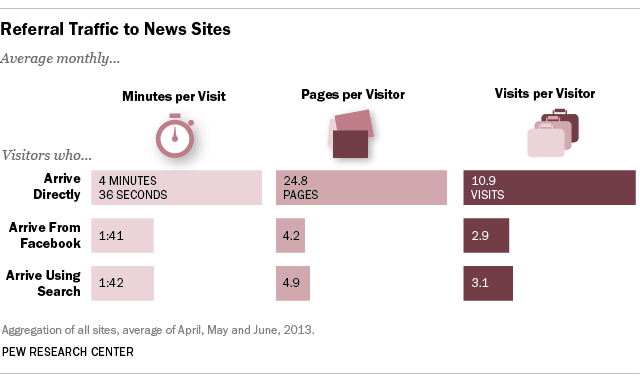 5Visitors who arrive at news sites from Facebook are younger than other visitors. In 16 of the 19 news sites where age comparisons could be made, Facebook sent a significantly higher percentage of 25-34 year-olds to the site than did search engines or direct visits. For example, while 23% of the total audience to BBC’s web site was in the 25-34 age group, among Facebook visitors that number climbed to 41%. At Washingtonpost.com, 22% of the total audience fell within in the 25-34 age group, but 34% of Facebook visitors were in that younger demographic.